When I compiled my Top Ten all-time favorite fragrance list, Tabac Original was one that just about made it to the list. It was between putting Tabac and Brut on the list, and Brut just managed to squeeze its way in, by a hair. However, I could easily substitute Brut with Tabac, because Tabac Original is an incredible fragrance. I'd probably say it's either #11 or #12 on my list of favorites, tied with Grey Flannel. It's one of my most frequently worn fragrances as well. 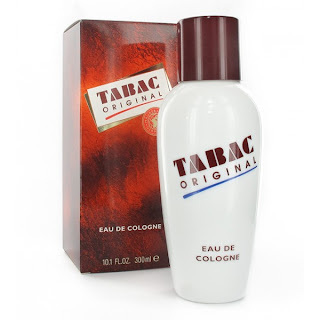 Despite its old guard style, in a way I'm surprised that Tabac Original has been around since 1955, because I've never smelled another fragrance that smells anything like it. It remains unique to this day, and though it's certainly old school to the core, it's also timeless in its style. I could wear this every day and never tire of it. There's been some debate as to whether or not Tabac smells like tobacco. I think it does, but it's more like the idea or concept of tobacco than the actual smell of a cigar or a tobacco leaf. It has a wonderful contrast of a wet, clean smell (from citrus and lavender) and a brownish, subdued and muted floral smell, all rounded out by musk, tonka bean and oakmoss in the base. It all blends together to create a deep brown, semi-smoky scent that conjures up images of lit cigars, pipes, and tobacco leaves. In fact, Tabac is a lot like the smell of a shirt or sweater after the guy wearing it was smoking a pipe for hours. It is a wonderful, perfect smell. My favorite fragrances are those that either create vivid images in my mind when I wear them, or cause me to have a strong emotional reaction to wearing them. Tabac Original does both. When I wear it, I feel like I'm in a swank jazz club in the 1950's, drinking a glass of scotch and smoking a cigar, with Tony Bennett on stage. Tabac is truly an adult fragrance, conjuring up thoughts and images that only an adult can really appreciate. You don't wear Tabac Original when you want to revisit your youth. Tabac is the kind of fragrance you wear when you want to feel grown up, to celebrate your savviness and experience in life. Most importantly, I feel good when I wear Tabac. I work in a stressful profession, but when I wear this cologne, I feel balanced, as if my stress is draining out of me and everything in the world is just right. I can't think of higher praise for any luxury item, never mind a fragrance, than that. Sounds like a masterpiece. Yet more proof that the whole "men's fragrances are dreck" philosophy is little more than hot air. It pains me that more people don't review things like this, or even give them the time of day, but I'm certainly glad you do. There's certainly no shortage of reviews on Tabac on Basenotes and Fragrantica, but I see your point about the blog world. Just about every fragrance blog I've seen focuses on niche fragrances. To each his own. Those kinds of blogs have no interest to me. The only reason I'd tell you to take the risk and blind buy Tabac is because of its low price. You can buy a 1.7 oz. tester of the EDC for under $10 online. That being said, I gotta tell you that there's no guarantee you'll like this frag. A lot of people call it a granny or grandpa frag, because of the powdery floral notes, and that it doesn't smell ANYTHING like what today's industry thinks of as a masculine scent. I consider this a love/hate fragrance. Years ago when I first smelled it, I hated it. I have my good friend SillageMonger from Basenotes to thank (he's been wearing this stuff forever) for convincing me to give it a second chance. Now I consider Tabac to be one of those few scents I couldn't be without. You've probably already heard this, but if not, you need to be careful in ordering Tabac. I'm reviewing the EDC, not the EDT. The EDT is a completely different scent, despite the same packaging. I really like the EDT, which I'll be reviewing soon, but it's just very different from the EDC, not simply an issue of concentration. The EDT is a powerhouse fragrance, whereas the EDC is a gentlemen's scent. When people gush over how much they love Tabac Original, they're talking about the EDC almost always. The EDC is the original scent, where I believe the EDT was released in the 1980s. Thanks for the heads up on the difference between each version of Tabac. I'm largely unfamiliar with this scent, and for whatever reason always forget to grab it whenever I'm in one of my favorite shops. I know a guy who may have the EDC for cheap, and may very well have the EDT, also. In terms of the oldschool unorthodox nature of the scent, I should level with you: I love powdery florals, but they're hard to come by. One of the reasons I love Old Spice is that it's a powder bomb in the drydown. Very little in the way of flowers, though. If Tabac fills that gap, all the better! Thanks again for the review. Then I definitely think you'll like this. If you're into Old Spice, Skin Bracer, Brut and that kind of stuff, you should love this. Okay, I grabbed a bottle of Tabac EDC today and tried it out. You're right, this is gorgeous stuff. But you know what it reminds me of immediately? Boucheron Pour Homme! This is a citrus chypre! It smells so close to Boucheron that it negates my ever having to grab a bottle of that. The biggest difference between the two is that Tabac is more floral and has that nice tobacco-like amber in its heart, while Boucheron stays simpler, a powdery citric with hints of lavender. Check out the Michael Edwards Leffingwell Fragrance Genealogie chart to see its positioning alongside Eau de Cologne Imperiale and Eau Sauvage, with Boucheron falling right beneath them. Hm. I can't say I smell similarities to Boucheron PH, but if you do, then what a great fragrance to emulate. For me, Boucheron smells like gold citrus, with a sharp mossy edge to it. Tabac smells brown, leathery and soft to me. The floral notes smell stronger to me in Tabac, though they lack the sharpness of the florals in BPH. Keep wearing Tabac - it's pretty complex, and I'll bet you smell something new every time you wear it. I know I do. You're right, the bottle itself is awesome, and is of high quality. Hell, even looking at the porcelain white bottle is a stress reliever! By the way, your comment above makes for a great review. You should post it on Basenotes. Thanks shamu - I appreciate your kind words - I might just do that! If I had to cull my reserve down to one fragrance, Tabac EDC would probably be the last man standing. Versatile, classic, potent without being offensive, Tabac EDC is what in baseball might be called a "five tool" player. When I'm really enjoying this one, I wonder if it could be my "desert island" scent too. It's really perfect. Plus, the longevity is incredible for such an inexpensive, relatively light fragrance. I can smell it for at least 12 hours on my skin, and that's with just a few drops from the splash bottle. Such a great review and comments for this less-known (thank God for this) opaque-white gem. Just reading the comments and remembering its smell and bottle made me calm. You all rock!